Having a fast website is important for both visitors and Search Engines. If your site takes too much time to load, you’ll definitely lose some potential visitors. They won’t come back again. Increasing page speed can dramatically reduce bounce rate off your site and increase the conversion rate. Plus it is also an important factor in Google Search Engine Rankings. Google always try to serve the best results to their users and slower sites are not the best ones. Though it’s not a must for SEO but still a good practice. Read here. Your site speed and performance depends on many things. Like – good hosting provider, Server load, server performance, size of the page, technology used to create the site, number of files, images, css etc. Before reducing your site’s load time; you need to know which things are causing problems and which issues need to be optimized. So here on this post, you’ll find tools to check out your website speed and performance. There are hundreds of tools available online for this purpose but not all of them are great and resourceful. Here are three tools I have used myself and found quite good. On this post you’ll only know which tools you can use to check website performance. We’ll later write in-depth posts on how you can optimize your website for the best performance. This is a website performance checking tool from Google developers. This tool will show you – how your site is performing and how you can improve it following their instructions. Go to this URL – https://developers.google.com/speed/pagespeed/insights. You’ll find a field to insert your URL. Put your URL and Click on ‘Analyze’ button. 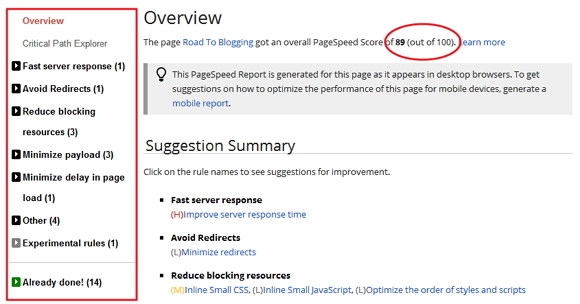 Now you’ll see this text on your screen – “Running PageSpeed Insights..” It will take few seconds to analyze your site. Then it will show the analyzed results. Check the image below. Analyzing your site, Google will give you an overall score on your sites’ performance. I got 89 out of 100. On the left side of the screen, there is a list of things you’ll see. These are the suggestions from PageSpeed Insights which you need to do for better performance.You can also find the things you have already done. From the left navigation click on “Critical Path Explorer“. This screen will show which file took how much time to load. On the top you can see a time bar showing different times. And the list below that shows the timeline for various files from your site. You can also select whether the tool should check your website from Desktop or Mobile. You can select that from right side of the screen. Now let’s move on to the second one. This is another good tool to check website Speed and performance. There are some extra features which you won’t find in Google Page Speed Insights. Go to this URL – http://tools.pingdom.com/. You’ll see a field to put your URL. Below that there’s a setting button. Click on that. You can select from which place they should check your site. You can also select if you want a Public or Private test. Now put your URL on the box and click on Test Now. The test will start and you’ll see this message – “Hang on, starting test…”. Then you can see the test going on. Just Like PageSpeed Insights, Pingdom gives you a grade. I got 91 out of 100. They also show the page size and number of requests sent to the server. Below that they show how fast your site is than others’. My one is faster than 72% of all tested websites. You can see four tabs underneath – Waterfall, Performance Grade, Page Analysis and History. Waterfall – This will show the size of the files on the page and their loading time. Performance Grade – Here you can see factors analyzed on which site performance depend. Page Analysis – This tab shows Server Errors, Re-directions or Connection Errors data. History – If you’ve checked your site speed with this tool before, this will show the history as a chart. GTmetrix is another good and one of my favorite speed checking tool. They do an in-depth optimization of sites and give suggestions to how to make them faster. Go to this URL – http://gtmetrix.com/ and put your URL. Now click on the ‘Go’ button. It will take few seconds to check your site. Here they give grades to sites. YSlow is Yahoo’s guideline or method to speed up a site. GTmetrix utilize that and show how you can speed up your site. ‘Timeline’ under Breakdown shows which file took how much time to load. If you checked your website speed with them before you can find them under History tab. If you are running your site on WordPress CMS, they have some WP Optimization Tips. You can follow them for better results. You can also know how to reduce load time using optimized images. You can also Re-test the page speed or compare it to another URL from ‘Options’ on the left side. Their suggestions to speed up any site is quite good. I followed many of them and was able to reduce the load time of my site. So here is the list of the tools to check page speed. We will later write on how you can speed up your site following the suggestions of these tools. Before that you can use CDN to Speed up your site. Update : Here’s our post on How to Speed up WordPress Blogs. Hope this helps you to optimize your website for better performances. Let us know if you find any difficulties using them. Also let us know if you’re using any other tools to check website speed and performance. Great post and I use all 3 of those sites for checking. However, clicking on ‘Test Now’ in Pingdom always give me totally different results usually ending in the fastest load speed for my site! The more I click ‘Test Now’ the better the results. Which reading should I go by? Hey Toni, When you check your site in Pingdom for the first time, it shows the loading time for your first time visitors. If you click the ‘Test Now’ button again it will show the loading time for the second time or regular visitors. However, if you think Pingdom doesn’t show the exact results, you can consider Google Pagespeed Insights’s results. Hope it helps. Thanks Istiak. With Pingdom now and then a page may show 12 seconds which I know is incorrect! I’m also wondering if internet speed effects the results! My average speed time is 1 second however I have only just realised if you make a change to a page, plugin etc we should wait 30 seconds before the second test! Google showed 1.9 seconds. I think that Pingdom is good to analyse page size, perf. grade but not ‘Load Time’ An example is: I just tested my site which came up with 18 seconds and a second test at 927ms! Agree with you. We can use Pingdom for analyzing page size and Google Insights for checking Loading time. Nice tools to get website performance report. All tools are very Nice But Mainly i prefer to use pingdom.